GDX had 18 weeks selloff since mid August 2016. It finally bottomed on 12/20/2016 at 70.7% retracement of the entire advance it made in 2016. It is currently in the 3rd week of the new weekly cycle. It is 12 days into the daily cycle. The top @ 23.35 made on 1/5/2017 met 38% retracement resistance of 23.63. The top is in. We expect GDX to be sideways down in the next 6-10 trading days. The bottom could last all the way until Jan 23 2017. 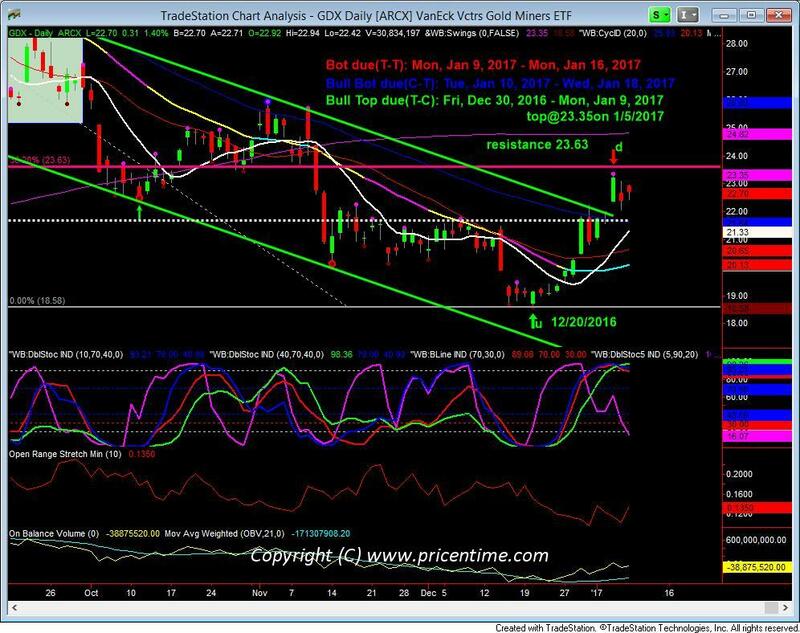 This entry was posted	on Monday, January 9th, 2017 at 11:36 am	and is filed under Hot Stocks, Precious Metals. You can follow any responses to this entry through the RSS 2.0 feed. Responses are currently closed, but you can trackback from your own site.